There are many types of home window alarms. If you are looking for ways to protect your home from a burglar, it is good that you thought of the windows. Many people fail to install an alarm for the windows. In 30% of all break-ins, the point of entry is a first floor window according to insurers. So here's a look at your options. A house alarm system may include sensors that attach to the windows. Usually a specific number of sensors are provided when the systems are purchased. Additional sensors can be purchased if needed. A conventional electric house alarm system or a wireless version can be purchased. In systems connected to a central monitoring service, the conventional systems contact the service via regular phone lines. The disadvantage is that a burglar can cut the phone line and prevent the service from being contacted. Wireless systems contact the service via cellular. They will operate even if the power goes out. Most types of these home window alarms are triggered when an electrical circuit is broken. Raising the windows breaks the circuit. 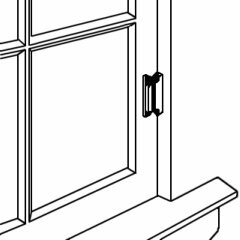 If the windows are large enough, a burglar can bypass this type by breaking the window, pushing it in and climbing through. A house alarm system with a motion detector provides an additional layer of protection. Some wireless self-installed models include both the sensors and the motion detectors. An alternative to the electric circuit types of window alarms is security film. The thin transparent polyester sheets do not prevent breakage or sound an alarm. They make it impossible for a burglar to push the broken glass into the inside of the house and unlock the frame or climb through the hole. Other alternatives include bars, pins, sashes and keyed locks. An alternative to the whole house alarm system is a simple wireless device that runs on batteries and sticks on to the pane with double-sided adhesive tape. This version is self-contained. The moment the panes are broken or even rattled, a high-pitched siren goes off. Often that's enough to scare away an intruder. If not, it should be enough to alert anyone in the home or general vicinity that a robbery is in progress. There is another self-contained version that works in the same manner as the electric circuit type. The windows must be raised in order for this type to trip the siren. You could use a single type or a combination of the different types of window alarms to secure your home or place of business. Just be sure to do something.